45mm titanium case, black dial, automatic ML 122 movement with dragging hours, off-center moon phase, day-night indication, and date, crocodile leather strap. Water resistant to 50 meters. 43mm stainless steel case, rhodium dial, automatic ML 122 movement with off-center moon phase, day-night indication, and date, crocodile leather strap. Water resistant to 50 meters. 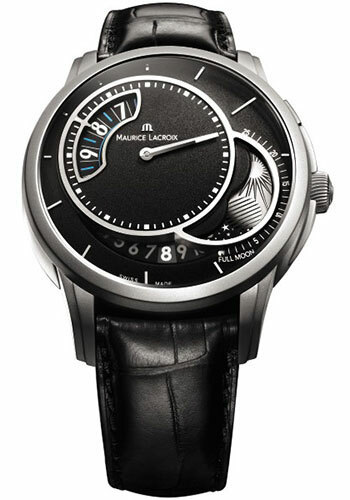 43mm stainless steel case, black dial, automatic ML 122 movement with off-center moon phase, day-night indication, and date, crocodile leather strap. Water resistant to 50 meters.